We are Caricature Artists covering Montreal and the rest of Quebec. We draw live digital caricatures as well as traditional caricatures at live events. We produce studio Caricatures from photos, Illustrations and cartooning for personal use, newspapers, publications, film makers, animation producers and more. Our illustrations and caricature drawings have been used widely on screen and print media. We create Gift caricatures and marketing illustrations in digital or traditional media. 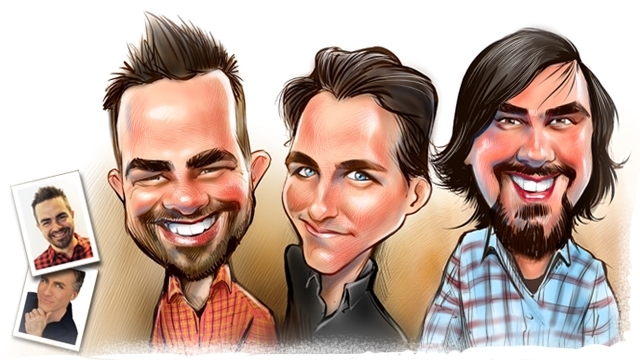 Hire a caricature artist for your event, corporate gathering, trade show or your wedding. Your guests will indulge in laughter and take a beautiful original caricature with them as memorabilia. We have been drawing live digital caricatures in Montreal and across Quebec since 1991 and continue to grow. Montreal is a beautiful cultured city with great citizens who appreciate beauty and diversity. Montreal is home to some the best caricature art in the country.